Your FIFA World Cup hack Referee Graham Poll brandishes Josip Simunic's third yellow card of the match. AUSTRALIA'S 2-2 draw with Croatia to progress to the Round of 16 at the 2006 World Cup in Germany was a great moment in Australian sport. But for referee Graham Poll, it was a night to forget as he achieved the unusual distinction of issuing three yellow cards to the same player - the Australian born and raised Josip Simunic. 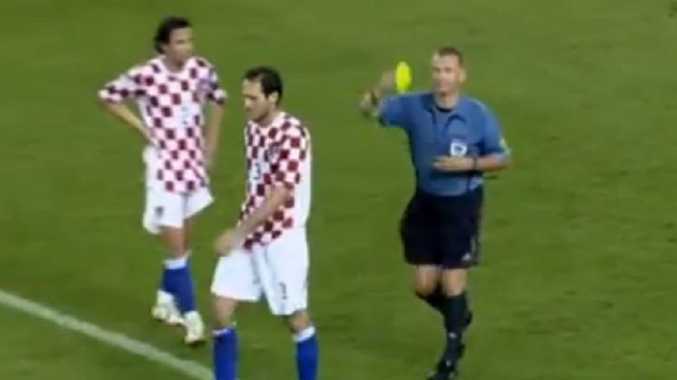 England's top referee at the time and a contender to take control of the final, Poll had refereed two previous games at the 2006 tournament - South Korea Togo and Saudi Arabia v Ukraine - without incident. However his handling of Australia's match was shambolic, with the three yellows capping a display from Poll which verged on the bizarre and led to his retirement from international tournament finals refereeing. Simunic's first controversial involvement in the match came in the seventh minute and should have resulted in a penalty and potentially a straight red. Socceroos striker Mark Viduka was in the penalty area with the ball at his feet when Simunic brought him down with a rugby tackle. Incredibly, no action was taken. The yellow card drama started about an hour into the match. In the 61st minute, Simunic fended off Harry Kewell near the edge of the Croatian penalty area and was, perhaps harshly, shown his first yellow. Then in the 90th minute, Simunic hacked down Josh Kennedy near the centre circle and Poll booked Simunic again. Josip Simunic rugby tackles Mark Viduka in the penalty area in the seventh minute. The defender knew he was about to be shown red and with a resigned expression started the slow walk to the dressing room. However he soon realised he wasn't going to be sent off and remained on the field. More is to come from a clearly flustered Poll. In extra time Josh Kennedy appeared to be dragged to the ground and as the ball bounced across goal Socceroos striker John Aloisi was on hand to poke it into the net and send the Australian fans into delirium. But incredibly, Poll had blown for full time just as Aloisi's foot made contact with the ball and the game finished 2-2. The farce is complete after full time - Viduka hugged Poll before Simunic remonstrated with the ref. Poll fended Simunic away and went to his pocket to produce Simunic's third yellow card of the night, followed by the red card Simunic should have received three minutes earlier. Poll was sent home from the World Cup after the match, his dream of refereeing the final shattered. He retired from international tournament finals football a week later. He returned to refereeing in the English Premier League the following season to find himself serenaded by fans singing 'World Cup, and you f...d it up' to the tune of Pet Shop Boys' 'Go West' while spectators also brandished 'yellow cards' with the number three written on them.